This is a video & slide show of our trip in 2008 on Black Diamond. 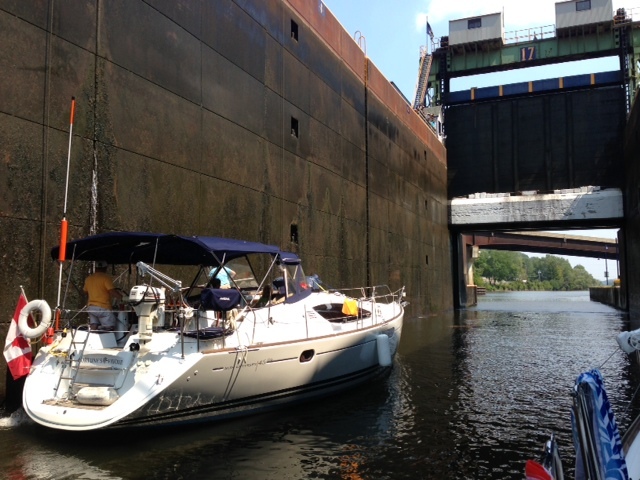 We cruised the Erie Canal and down the Hudson river to New York the last week of August. The trip started near Toronto, Port Credit, and ended near New York City. With our Jeanneau 39iP, Sailboat. This trip served as part of our summer vacation, and also part of our re-position and delivery of our boat on it’s way down to the Bahamas where we spent a few months of the winter of 2008/09. Please view this video and slide show. We’re a French family and we intend to sail from New York to Toronto in 2 years. Could you please tell me if it is possible to do so with a draft àf 6,5 feet ? Many thanks for your video, very useful ! Yes it is, our boat has a draft of 6 1/2 feet also. Search our blog categories on the right side, Toronto to NY and NY to Toronto. Next story * VIDEO * New York to Florida, Offshore Non-Stop, Tropical Storm.